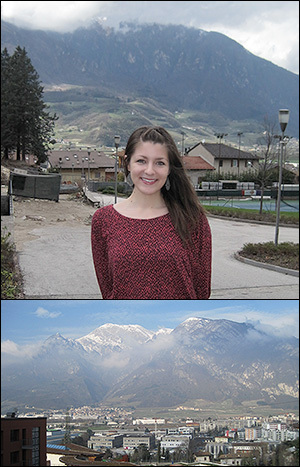 Graduate student Jessica Terrell in Trento, Italy. A Ph.D. student working with Professor William Bentley's (BioE) Biomolecular and Metabolic Engineering Laboratories is the first exchange student to travel to Trento, Italy under an agreement between the the University of Maryland and the University of Trento. The agreement is part of a broader partnership facilitated by ISR and cemented in 2011 that also includes the University System of Maryland, the State of Maryland, the Autonomous Province of Trento, the Consiglio Nazionale delle Ricerche, and Fondazione Bruno Kessler. In the bi-directional student exchange, Maryland grad student Jessica Terrell (BioE) is spending two months working in Professor Sheref Mansy's research group at the University of Trento’s Centre for Integrative Biology. Prior to Terrell's visit, Mansy sent his advisee, University of Trento graduate student Roberta Lentini, to work with the Bentley Group in College Park. The two students' research is complimentary. Terrell will build artificial cells composed of a lipid bilayer and the cellular machinery required to transcribe and translate genes into functional proteins. The synthetic cells are designed to interact with each other and with bacteria through quorum sensing, a form of intercellular communication based on the release and detection of signaling molecules. For the past several years, the Bentley Group has explored how manipulating this chemical language could prevent bacteria from engaging in pathogenic activity, or encourage them to take a positive action. "Roberta is working on an artificial cell that can respond to a quorum sensing signal [molecule], autoinducer-2, and I am building one that can synthesize and deliver autoinducer-2," Terrell explained. "This project is groundbreaking because it changes the way we can program living cells," says Bentley. "Synthetic biology is largely stuck on the single viewpoint that in order to modify cellular behavior, the genetic content of the cell must be changed. Our new approach transiently and safely takes over natural cells through chemical communication with artificial cells. The artificial cells will sense molecules that are secreted from natural ones, then respond by sending back chemical signals that direct natural cells' function." The technology, he adds, has far-reaching implications. "Cell-like systems capable of this sort of communication could be built to block bacterial transitions to virulent states and to guide stem cell differentiation, which could lead to the treatment of infections without antibiotics and improved tissue regeneration for people with serious injuries." The exchange is part of "Control of Living Cells Through Communication with Artificial Cells," an ongoing collaboration between the Bentley and Mansy Groups. The project is one of three funded by the Autonomous Province of Trento as part of the Maryland-Trento partnership. -- Thanks to Faye Levine for the story and photos.